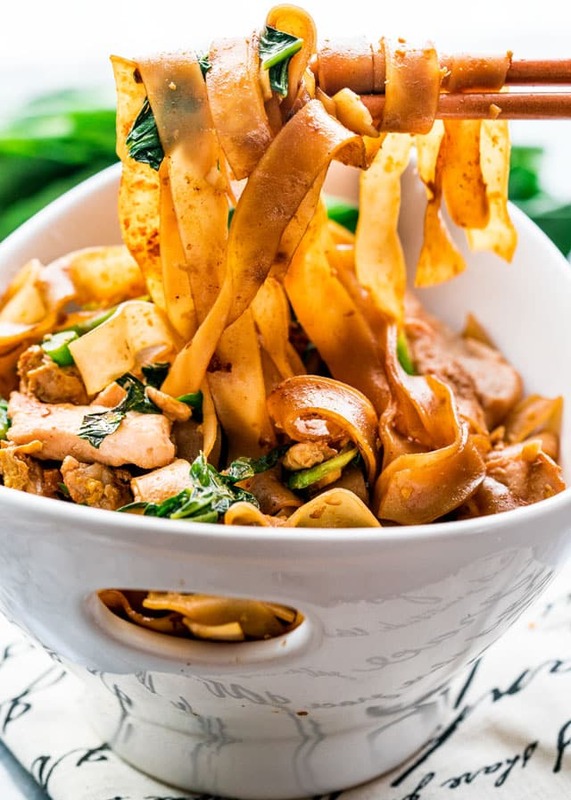 This Pad See Ew recipe is a popular Thai street food that’s so delicious and super quick to make. Forget take-out, make this at home for the whole family to enjoy! When my friend came over last week to hang out with me, we decided to have a Thai cooking day. We both love Thai food so it was a no brainer. We made Pad Thai and Pad See Ew to eat and hubs made us Mojitos to quench our thirst. It was a fun day! Our bellies were full and our thirst sure was quenched. Nothing like cooking with friends or family and enjoying good food and good company. 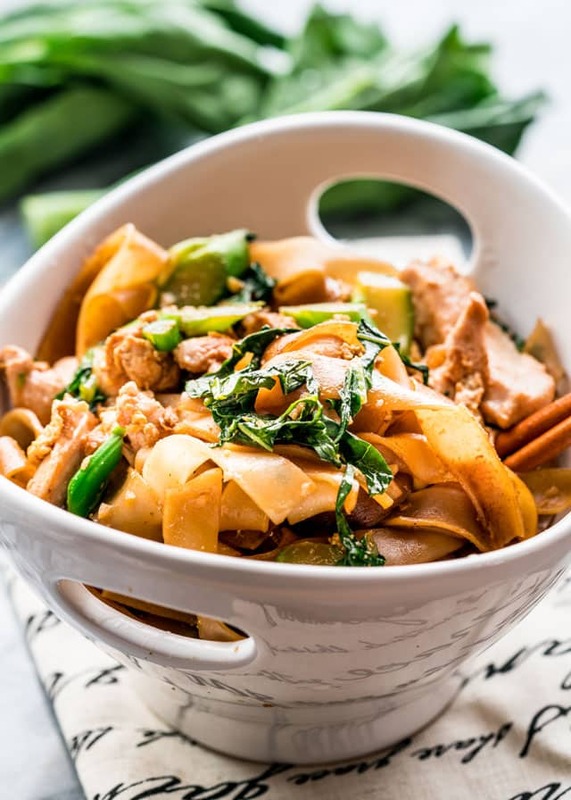 Pad See Ew is a very popular dish in Thai cuisine. It’s actually considered their fast food and trust me it is fast. See Ew means soy sauce and pad means to stir fry so pad see ew basically means soy sauce stir fry. Don’t you all just love learning new languages? This dish is usually made with fat wide noodles because they are really nice and chewy. There aren’t really that many ingredients for Pad See Ew when you think about it. You’ve got noodles, broccoli and a protein, then the sauce ingredients. I chose to use chicken here but you can use beef, tofu, or whatever you like. If you do use beef I would still recommend you toss the beef first with a bit of oil and soy sauce before cooking it. I do this because when you cook the beef or chicken this will ensure the meat will separate nicely and won’t stick together. The noodles that are usually used are extra thick and flat rice noodles. What I usually do is place the noodles in a bowl filled with cold water, and let them soak for about an hour before using. Of course, you can use the thinner rice noodles, but these thicker flat noodles are more authentic and perfect for this dish. If you cannot find Chinese broccoli just go ahead and use regular broccoli or broccolini. However, if you have a good Asian store or market nearby, I really recommend to go and buy the black soy sauce and Chinese Broccoli. Black soy sauce can also be substituted with dark soy sauce, but keep in mind black soy sauce is a bit sweeter because it does have molasses in it. As a matter of fact when you open the bottle the strong molasses smell will hit your nose first. Prepare the noodles first, by placing them in a large bowl with cold water and let them soak for about an hour. In a small bowl toss the chicken with the tsp of peanut oil and soy sauce together, making sure the chicken is coated in the oil and soy sauce. This will ensure the chicken separates nicely when cooking and seasons it a bit. Combine all the sauce ingredients together and set aside. Cook the chicken in the wok with a bit of oil until it’s no longer pink then remove it from the wok. Add the remaining oil and saute the garlic for a few seconds then add the eggs. Break the egg yolks then let it sit for about 15 seconds before starting to scramble them briefly. Add the broccoli and toss to coat with the oil and the egg. Cook briefly for about 15 seconds. Add the prepared noodles to the wok, the prepared sauce and the brown sugar to the pan. Turn the heat up and start tossing the noodles to coat evenly in the sauce. Spread the noodles over the entire surface of the pan, and let them sit without stirring or tossing for about 30 seconds. This will ensure you get some nice charred marks on the noodles, which will give them a beautiful toasty flavor. Flip the noodles and again let them sit cook for another 30 seconds to char the other side. Toss the chicken back in. If you’re lucky enough to have leftovers, store them in an airtight container in the refrigerator for 3 to 4 days. Reheat in the microwave. 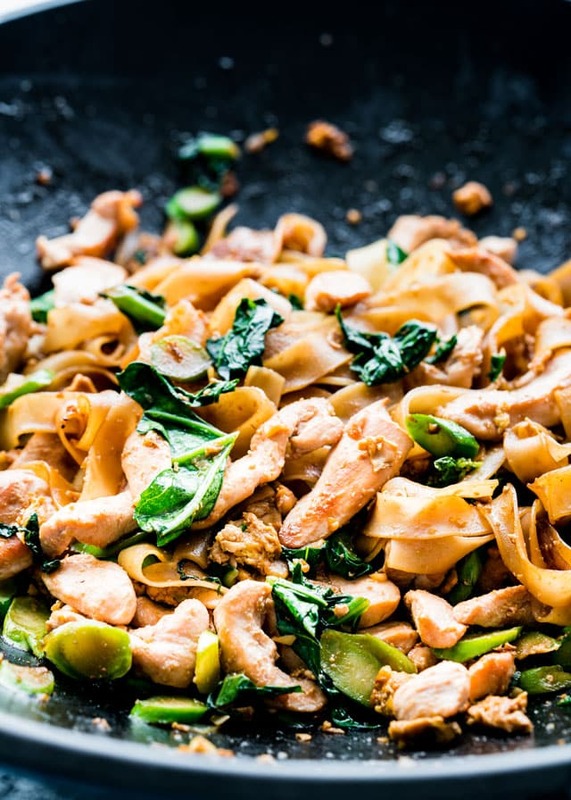 This Pad See Ew is a popular Thai street food that's so delicious and super quick to make. Forget take-out, make this at home for the whole family to enjoy! Prepare the noodles first by following the instructions on the package. I usually place them in a bowl and add enough cold water to cover them and let them rest for 1 hour or until noodles are pliable but not soft. Drain well in a colander. They will change color from translucent to white. Start by adding 2 tbsp of the peanut oil to the wok and heat it really well. Add the chicken and cook just until done, about 2 to 3 minutes. Remove the chicken from the wok and set side. Wipe away any excess liquid that's left in the wok with paper towels. Add the remaining 1 to 2 tbsp of peanut oil to the wok, then immediately add the minced garlic before the oil gets too hot. This will prevent the garlic from burning as soon as it hits the wok. Saute the garlic for about 30 seconds just until the garlic starts to get aromatic and turns golden. Add the eggs, break the egg yolks then let it sit for about 15 seconds before starting to scramble them briefly. Add the prepared noodles to the wok, the prepared sauce and the brown sugar to the pan. Turn the heat up and start tossing the noodles to coat evenly in the sauce. Spread the noodles over the entire surface of the pan, and let them sit without stirring or tossing for about 30 seconds. This will ensure you get some nice charred marks on the noodles, which will give them a nice toasty flavor. Flip the noodles and again let them sit cook for another 30 seconds to char the other side. Toss the chicken back in. Remove from wok and serve with immediately. Sprinkle with some red Thai chiles if preferred. Black soy sauce is a rich and thick sauce, made by fermenting regular soy sauce with sugar or molasses. If you don't have or cannot find black soy sauce, you can use dark soy sauce. Dark soy sauce is a bit saltier than black soy sauce, so I would reduce the amount a bit. Chinese broccoli or Chinese kale is a leafy vegetable that is thick and flat with big leaves and thick stems with flower heads. Similar to broccoli, so if you cannot find Chinese broccoli, use regular broccoli or broccolini. Tasty and easy to prepare. We added some chilies to spice it up and bean sprouts and used thinly sliced beef instead of chicken, my family loved it. Thanks for the recipe! Delicious! This recipe is definitely a keeper. Didn’t have any Chinese broccoli, so left it out. Next time I’m going to substitute it with regular broccoli. You really provide me with awesome recipes that I can share with my family. I look forward to your emails every single day to see what recipes you have ready for me to enjoy. I also love looking through my Pinterest and Instagram of your pages. Thank you for doing what you do. You are a blessing in my life. thank you for sharing your recipe, I like how you outline your recipes for me it makes so much easier to prepare. keep up the good work. I cant wait to make this one! Everything you do is perfect! Delicious! Was looking for something similar to Thai Express Pad Sew. Taste is the exact same! Thanks so much! Loved your wok! Is it a cast iron wok? i am a vegetarian can you suggest an alternative to oyster sauce? It is! It’s from Le Creuset. Hoisin would make an excellent alternative. Our favourite weeknight meal. Easy, versatile, cheap and delicious! Wonderful! 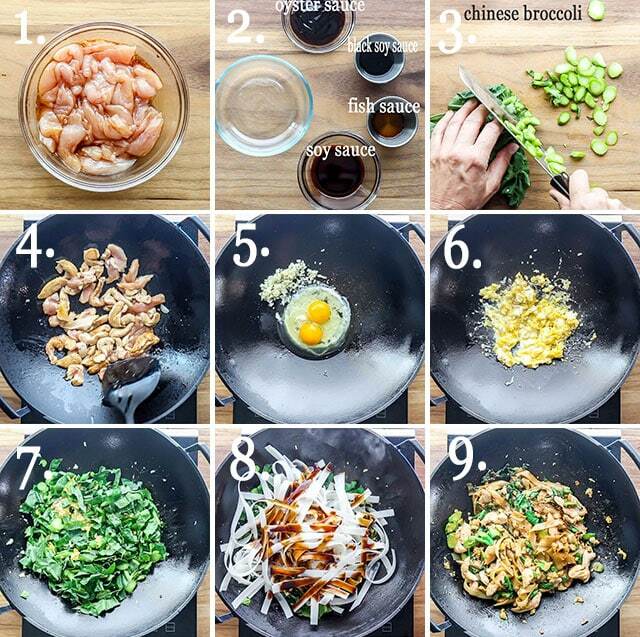 Prepare your ingredients & wok. Sweet savory smoky flavor. Very filling. Comfort food for sure. I used beef ribeye which I had on hand & regular broccoli. I also used preprepared noodles from the International section of grocery. Came out great! Had family coming in kitchen to check out great smell! Will do again next week. Thank you very much. Hey Cheryl, so happy you liked this! Even my pickiest eater loved this! Sriracha to the rescue for my spice loving family members. I will be trying more of your recipes! Are you using dried noodles or fresh? I tried the recipe with dried since I have never seen fresh and it took quite awhile for the noodles to get to al dente. Flavor was great though. They’re dried noodles, but they’re rice noodles so they shouldn’t take long to cook at all. Did you follow my suggestion for cooking them? 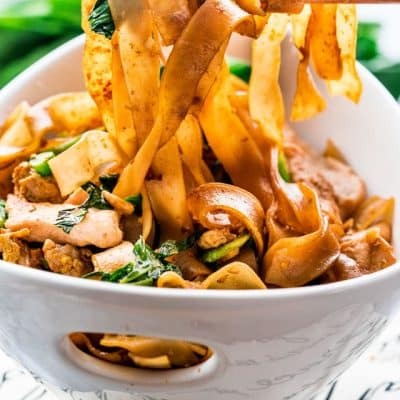 Your photo of Pad See Ew is so beautiful that I feel hungry now! Thank you for sharing the recipe! It looks so good! Thanks, it is very good! Hope you try it soon. I am in Australia, in you Pad See Ew recipe, would the black soy sauce you refer to be what we are able to get as Ketjap Manis or sweet soy? I can only find mushroom soy sauce, light soy sauce, salt reduced soy sauce and soy sauce. Looking forward to making this. I think Kecap Manis should be fine as a substitute, but black soy sauce has molasses in it, so yeah it’s a bit sweeter, but it also gives the pad see ew that nice dark color.